Phygelius (pronounced fy-JEE-lee-us), commonly called Cape Fuchsia, are a semi-evergreen shrubby specimen that is hardy to 0°F and stays green to 20°F. It may appear to die to the ground in the coldest temperatures, but is hardy enough to return year after year. The individual flowers are normally about 2-inches long and look like the body and gently flared bells of trumpets, dangling in 8 to 10-inch colorful, fragrant clusters that hummingbirds can’t resist. 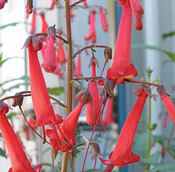 The 'Cherry Ripe' Phygelius Plant is one of the more elegant of this genus. With dark, forest-green to deeper bluish-green foliage, the pendulous blossoms that are reminiscent of the popular lipstick red shade of the 50s, is shown off to absolute perfection. One of the more compact varieties of Cape Fuchsia, this variety is often grown in large containers, as well as in the ground. Cherry Ripe Cape Fuchsia is a beautiful accent bloom for cut flower arrangements! The 'Lemon Frost' Phygelius Plant has heart-shaped, blue-green foliage that is mostly unremarkable, except for a very light silvery dusting. It will, though, remain green long after it has grown too cold for blossoms and is often grown as an evergreen in milder climates, such as that of the west coast. 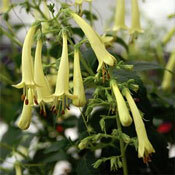 Lemon Frost Cape Fuchsia is grown for its huge clusters of lemony-yellow tubular flowers that attract those whimsical and fun hummingbirds like nobody’s business.